If you have a spare set of wheels, race wheels, or simply like to transport your bike without the wheel on the bike, the White Lightning Wheel Johnny makes transporting your wheels safe and clean! Put your wheels in your car without worrying about grease stains or store your extra wheels in your home, apartment, garage, or dorm room without worrying about damage. Made from a zip, water and UV resistant two ply rubber/nylon material, the Wheel Johnny is durable and designed to protect your wheels from the elements and your car or home from a mess. The Wheel Johnny features a zipper enclosure for easy access to both wheels, a padded divider to protect rims and hubs, and hand and shoulder straps for easy transportation. The Wheel Johnny easily holds two wheels and can accommodate road, hybrid, and mountain bike wheels, including 29er.s! With a large interior pocket, it is easy to carry any necessary spares with you including a cassette, chain whip, lock ring tool, adjustable wrench, and spare tubes. 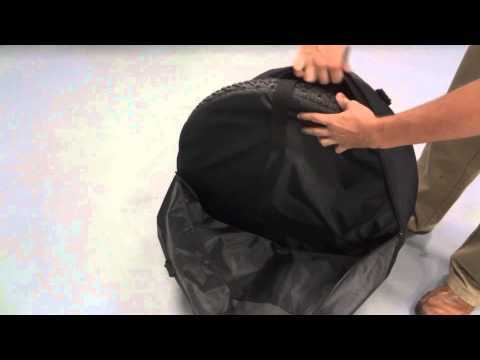 Use the Wheel Johnny for safe and clean storage and transportation of your wheels!